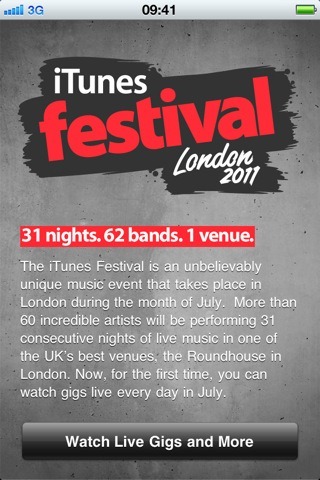 Today, Apple released the official app for the iTunes Festival 2011 which is scheduled to kick off on 1st July. The iTunes Festival is a music festival which is held every year in London. As the name implies, the series of concerts is sponsored by Apple. The first festival was held in 2007 with a modest lineup of artists. With each year, the lineup expanded both in terms of number of artists and overall popularity of said artists. This year’s festival will begin on 1st July at The Roundhouse art center in London. There will be 62 bands performing over 31 nights. The tickets are given away for free to people with iTunes accounts through competitions. You can apply for tickets from the official website. 31 nights. 62 bands. 1 official app. This July, the iTunes Festival returns to London, England. Featuring 31 consecutive nights of incredible live music in one of the UK’s best venues, this is the hottest ticket in town. The lineup includes Coldplay, Linkin Park, Foo Fighters, Paul Simon, Bruno Mars, Adele, My Chemical Romance, Duran Duran, Lang Lang and Moby — to name just a few of the great shows you can watch live on your iPhone, iPad, or iPod touch. Download the official app now to explore the lineup in more detail and watch the shows LIVE or on demand for a limited period from wherever you are in the world. You can even invite your friends to watch on the big screen with AirPlay support for streaming the gigs to your Apple TV. 2011’s lineup features some of the biggest names in the music industry: Arctic Monkeys, Jimmy Eat World, Coldplay, Kasabian Linkin Park, Moby, Foo Fighters, Bruno Mars and Adele are just a few names from the 62 band lineup. The official app comes with the ability to livestream the band performances on an iOS device from anywhere in the world (provided you have an internet connection, of course). The app also uses Apple’s AirPlay technology so you can invite your friends over and watch it all on your Apple TV-connected HDTV. 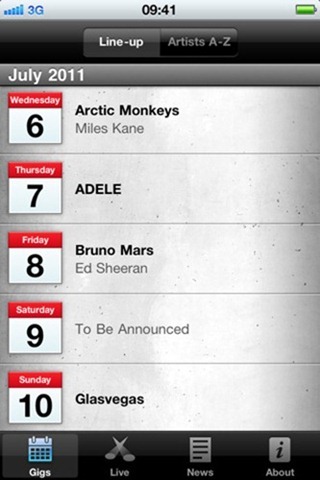 iTunes Festival 2011 works on iPhone, iPod touch and iPad. It requires you to be on iOS 4.1 or later. You can download the 9.7MB file from the link pasted below.